Dunbar provides all the amenities of a seaside town, combining historic buildings, spectacular landscapes, rugged coastline and varied shopping facilities with an excellent range of accommodation to suit all budgets. As an established resort, Dunbar is ideal if you are interested in golf, history, bird watching, rambling, cycling, fishing or sailing. Or perhaps you just want to spend a few days in a picturesque town relaxing and enjoying a refreshing change of pace, scrumptious ice cream (very moreish), attractive food from tea rooms, fish and chips, pizzas and up market restaurants, as well as a welcome breath of fresh air and invigorating walks. Dunbar became a Burgh in 1370 and a Royal Burgh in 1445. The town is steeped in history and was one of the most important Scottish fortresses in the Middle Ages. Its ancient castle ruin stands guard over the town’s twin harbours and is a reminder of more violent times. The 17th century Town House and High Street are excellent examples of the way in which the old world charm has been preserved. With its various shops, vennels, churches and other historic buildings Dunbar is full of character. Why not visit the inspiring John Muir’s Birthplace, the Lifeboat and Dunbar Town House museums for an entertaining and educational experience. Golf is one of Dunbar’s many attractions, with two quality courses to choose from, one of championship standard. Facilities exist locally for sea and fresh water angling, hill and guided nature walks, cycling with hire available, pony trekking, scuba diving, surfing, wind and kite boarding, plus brand new tennis courts, squash and bowling. Children will enjoy the activities at Lauderdale Park, which in 2004 received the Nancy Ovens award for play, East Links Family Park and the many sandy beaches nearby. In 2004, the beach at Belhaven Bay received the prestigious Seaside Award. 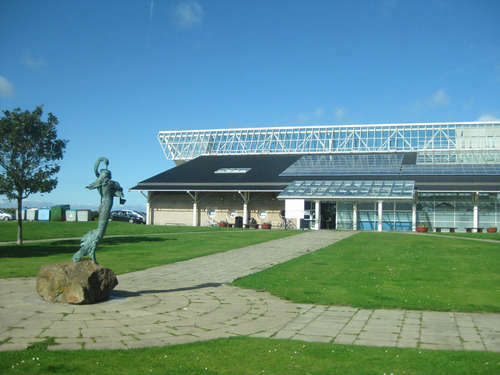 The whole family will enjoy Dunbar Leisure Pool, one of the most attractive in the county, with its wave machine, beach area, flume and other exciting water features. Hallhill Healthy Living Centre offers all weather sports facilities and provides a wonderful venue for other sporting activities.